LIVE entertainment!! FREE basketball camp!! FREE family event!! FREE kids zone!!! Rock climbing wall, face painting, carnival games, photo booth & astro jumps!! 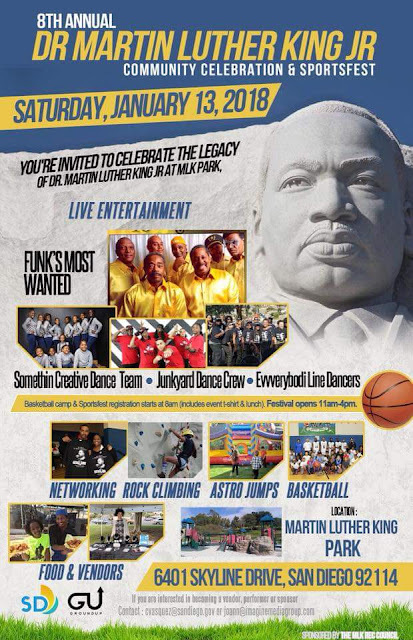 Activities that the whole family can enjoy at the 8th Annual Dr Martin Luther King Jr Community Celebration & Sportsfest at MLK Park, 6401 Skyline Drive, 92114. Saturday, January 13, 2018. 8am Sportsfest starts and 11am-4pm for the Festival.